Whether you have just one day or more on your itinerary, hit up Japan’s ski fields to get your winter fix. The Land of the Rising Sun is every snow-lover’s dream: think consistent dumps of light, dry powder, terrain that ranges from the easy to the epic, as well as world-class backcountry riding and ski runs through the trees. 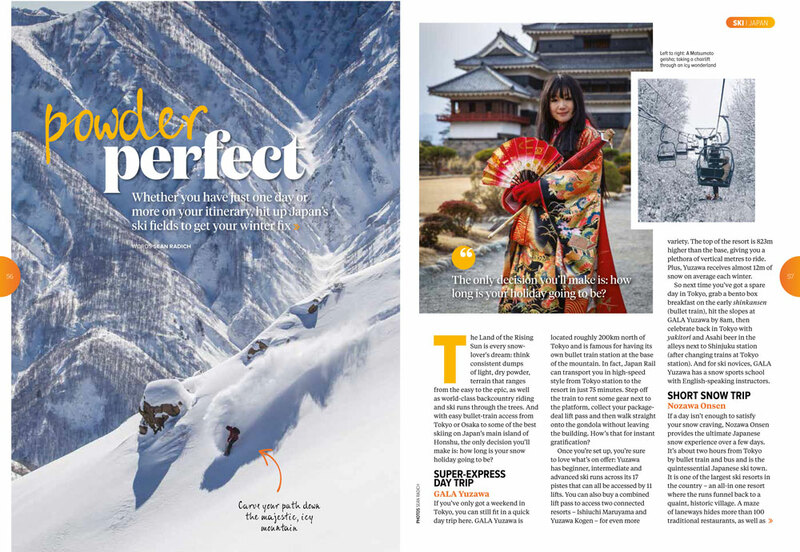 And with easy bullet-train access from Tokyo or Osaka to some of the best skiing on Japan’s main island of Honshu, the only decision you’ll make is: how long is your snow holiday going to be? El Rad enjoying the view. If you’ve only got a weekend in Tokyo, you can still fit in a quick day trip. GALA Yuzawa is located roughly 200km north of Tokyo and is famous for having its own bullet train station at the base of the mountain. 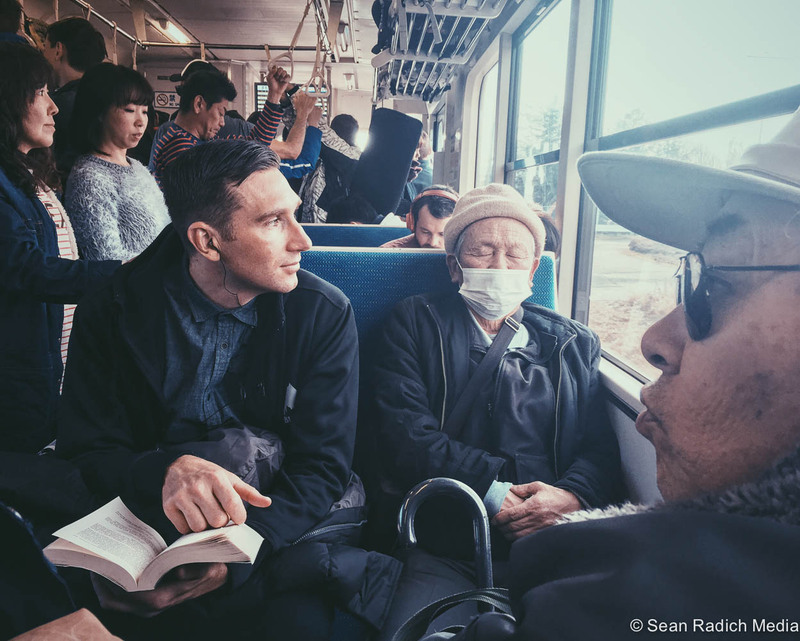 In fact, Japan Rail can transport you in high-speed style from Tokyo station to the resort in just 75 minutes. Step off the train to rent some gear next to the platform, collect your packagedeal lift pass and then walk straight onto the gondola without leaving the building. How’s that for instant gratification? Once you’re set up, you’re sure to love what’s on offer: Yuzawa has beginner, intermediate and advanced ski runs across its 17 pistes that can all be accessed by 11 lifts. You can also buy a combined lift pass to access two connected resorts – Ishiuchi Maruyama and Yuzawa Kogen – for even more variety. The top of the resort is 823m higher than the base, giving you a plethora of vertical metres to ride. Plus, Yuzawa receives almost 12m of snow on average each winter. So next time you’ve got a spare day in Tokyo, grab a bento box breakfast on the early shinkansen (bullet train), hit the slopes at GALA Yuzawa by 8am, then celebrate back in Tokyo with yakitori and Asahi beer in the alleys next to Shinjuku station (after changing trains at Tokyo station). And for ski novices, GALA Yuzawa has a snow sports school with English-speaking instructors. 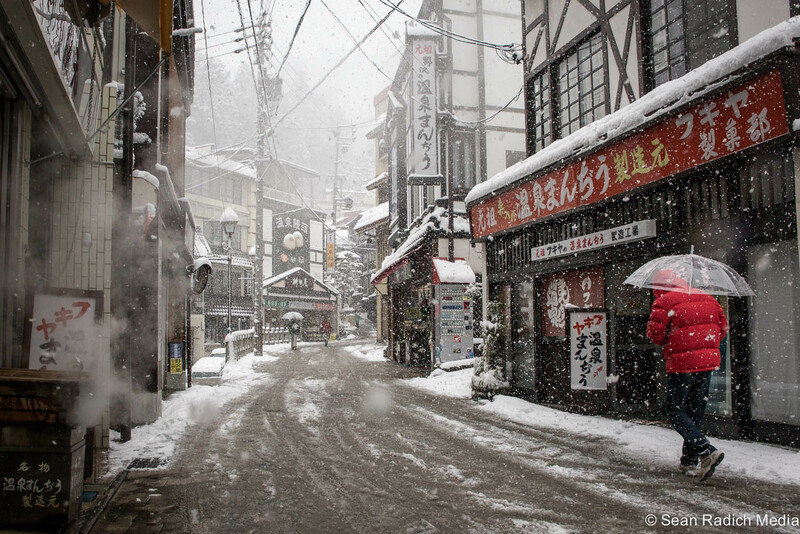 Nozawa Onsen is arguably Japan’s most picturesque ski town, particularly when it dumps. If a day isn’t enough to satisfy your snow craving, Nozawa Onsen provides the ultimate Japanese snow experience over a few days. It’s about two hours from Tokyo by bullet train and bus and is the quintessential Japanese ski town. It is one of the largest ski resorts in the country – an all-in one resort where the runs funnel back to a quaint, historic village. A maze of laneways hides more than 100 traditional restaurants, as well as bars and Western eateries. It was the famed 13 historic soto-yu public hot-spring bathhouses that attracted visitors to Nozawa before Austrians introduced skiing to the locals in 1912. Now, it’s the snowboarding and skiing that keep the town buzzing in winter. Beyond the historic temples and shrines, tucked among the towering cypress trees on the edge of town lie almost 300ha of skiable terrain and 50km of runs with a huge kilometre of vertical drop. For authorised tree riding (skiing through wooded areas), head to the top of the resort where a large section of forest is accessed by two lifts. 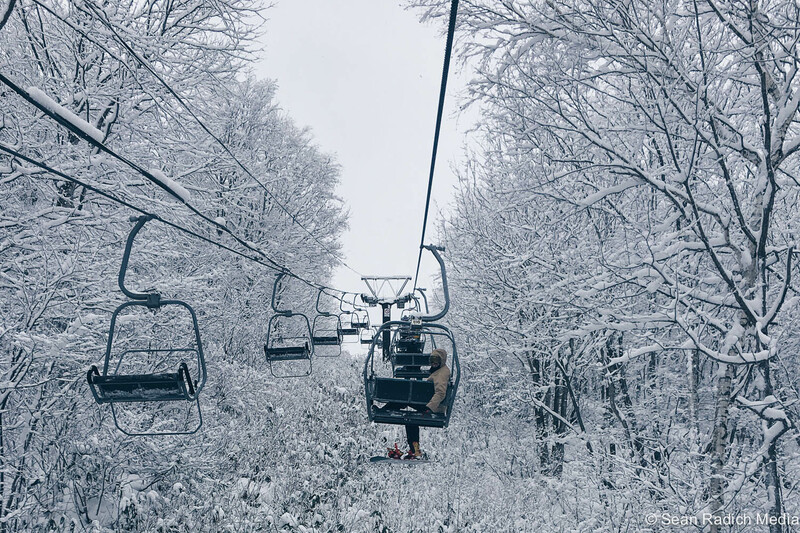 Being that high means the powder stays light and dry and the trees are powder-coated a shimmering white. 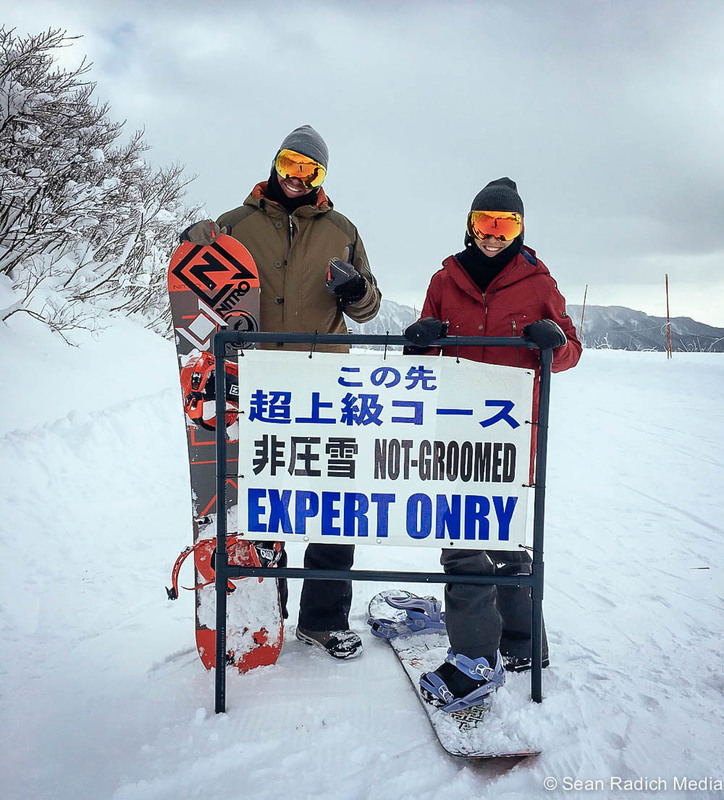 If fresh, groomed runs are more your thing, Nozawa has wide leg-burners, steeper high-speed runs and winding forest trails for all abilities. You’ll find one of the better terrain parks in Japan, with small to large jumps, rollers, some rails and a fun half pipe. If you don’t ski, explore the labyrinth of shops and eateries in town and the picturesque shrines and temples nestled in the forests nearby. Then, don a yukata (traditional dressing gown) and geta or zori (clogs or sandals) and stroll through town to take a steaming dip in one of the famous Nozawa onsen. Radman and Mary G getting lost in translation at Cortina. A world-class ski destination, the Hakuba Valley, three hours from Tokyo, has been attracting serious snow lovers from all over the globe for at least 70 years. With more than 200 runs, including some of Japan’s steepest, and 140km of pistes accessed by 135 lifts across 11 separate resorts, it’s easy to see why some consider it the jewel of the Japan Alps – and then there’s the huge 14m of annual snowfall. Happo-One Ski Resort is the main resort in Hakuba, and it provides all levels of skiing and snowboarding, as well as abovethe- tree-line alpine terrain and The Happo Banks Snow Park. Head to the top of Happo: a 30-minute hike up the ridgeline gives you backcountry options for kilometres down to the valley. The view atop the Alps is mesmerising, and the endless powder turns on offer are hypnotic. Book yourself a mountain guide with all the backcountry avalanche gear and you’ll be in for a day you will never forget. Afterwards you can kanpai those powder grins and goggle tans with an icy cold beer from one of the traditional pubs, or izakaya, in Happo Village. 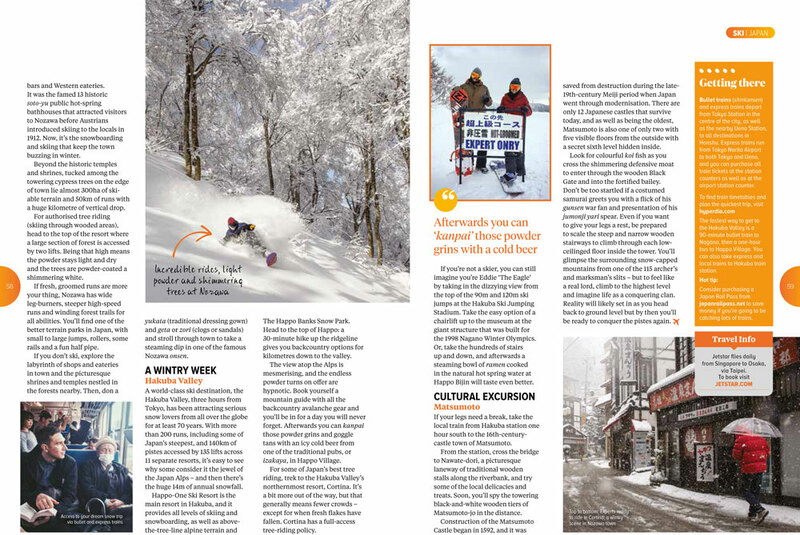 For some of Japan’s best tree riding, trek to the Hakuba Valley’s northernmost resort, Cortina. It’s a bit more out of the way, but that generally means fewer crowds – except for when fresh flakes have fallen. Cortina has a full-access tree-riding policy. If you’re not a skier, you can still imagine you’re Eddie ‘The Eagle’ by taking in the dizzying view from the top of the 90m and 120m ski jumps at the Hakuba Ski Jumping Stadium. Take the easy option of a chairlift up to the museum at the giant structure that was built for the 1998 Nagano Winter Olympics. Or, take the hundreds of stairs up and down, and afterwards a steaming bowl of ramen cooked in the natural hot spring water at Happo Bijin will taste even better. If your legs need a break, take the local train from Hakuba station one hour south to the 16th-century castle town of Matsumoto. From the station, cross the bridge to Nawate-dori, a picturesque laneway of traditional wooden stalls along the riverbank, and try some of the local delicacies and treats. Soon, you’ll spy the towering black-and-white wooden tiers of Matsumoto-jo in the distance. 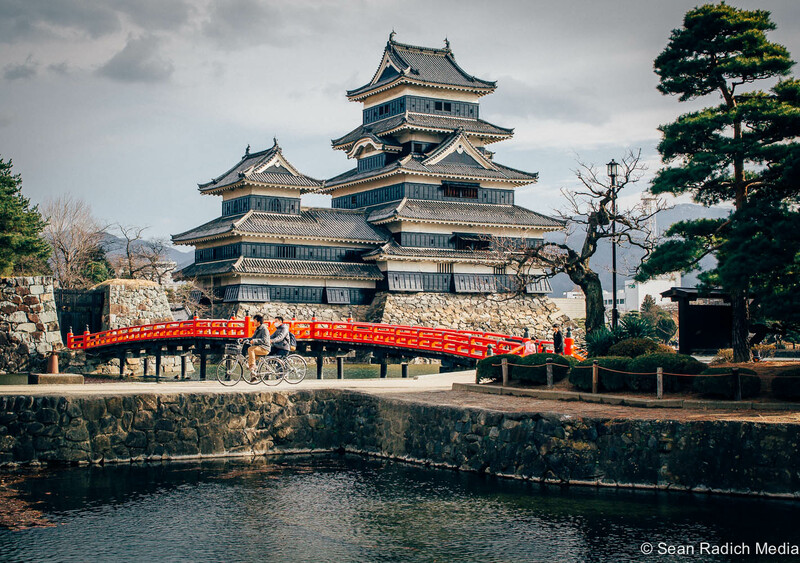 A slice of Japanese history awaits with a visit to Matumoto Castle. Construction of the Matsumoto Castle began in 1592, and it was saved from destruction during the late-19th-century Meiji period when Japan went through modernisation. There are only 12 Japanese castles that survive today, and as well as being the oldest, Matsumoto is also one of only two with five visible floors from the outside with a secret sixth level hidden inside. Look for colourful koi fish as you cross the shimmering defensive moat to enter through the wooden Black Gate and into the fortified bailey. Don’t be too startled if a costumed samurai greets you with a flick of his gunsen war fan and presentation of his jumonji yari spear. Even if you want to give your legs a rest, be prepared to scale the steep and narrow wooden stairways to climb through each lowceilinged floor inside the tower. You’ll glimpse the surrounding snow-capped mountains from one of the 115 archer’s and marksman’s slits – but to feel like a real lord, climb to the highest level and imagine life as a conquering clan. Reality will likely set in as you head back to ground level but by then you’ll be ready to conquer the pistes again. El Rad trying (and failing?) to blend in with the locals on the train. GETTING THERE: Bullet trains (shinkansen) and express trains depart from Tokyo Station in the centre of the city, as well as the nearby Ueno Station, to all destinations in Honshu. Express trains run from Tokyo Narita Airport to both Tokyo and Ueno, and you can purchase all train tickets at the station counters as well as at the airport station counter. The fastest way to get to the Hakuba Valley is a 90-minute bullet train to Nagano, then a one-hour bus to Happo Village. You can also take express and local trains to Hakuba train station. Hot tip: Consider purchasing a Japan Rail Pass from japanrailpass.net to save money if you’re going to be catching lots of trains. To see more of Japan, see my blog posts here.